I have attached the interactive PDF what we want to convert as Static PDF before opening in iPhone. We are interested in buying the converter, so please communicate what's the cost and the process for the same. Why do I receive the error message below when I try to open specific PDF forms? You can upgrade to the latest version of Adobe Reader for Windows, Mac, or Linux by visiting get.adobe.com/reader. This happens when I try render these PDF files using Foxit Reader, Nitro Reader and numerous other PDF viewers. I can only open the PDF using the latest version of Adobe Reader. Unfortunately, it's not easy remove this message and modify the PDF so that it can be opened in alternative PDF viewers. The person who created the original form must re-create the form using options that do not restrict which PDF viewers can open and display the file. Adobe has made the decision that since very few non-Adobe products support these special PDF files, that it is better to show this message -- and require the user to download Adobe Reader or Adobe Acrobat -- than it is to let the PDF viewer try to render the document. We strongly disagree with this decision that Adobe has made and will work to try to convince them to reverse this bad policy, which just causes needless confusion for users of PDF. 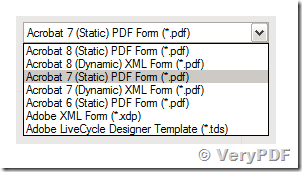 However, if you wish convert these Dynamic XFA forms to Static Page Contents in PDF file, you need open this PDF file in Adobe's LiveCycle Designer, save to a new PDF file with "Adobe Static PDF Form (*.pdf)" option, then you will get a new PDF file with static contents. If you are using LiveCycle, you’ll need to save the final PDF as a static form compatible with Acrobat 7. pdf2img.exe doesn’t work with dynamic forms or PDFs from later versions of Acrobat. This entry was posted in PDF Form Filler, PDF Toolbox Command Line and tagged flatten PDF, flatten PDF form. Bookmark the permalink. One Response to How to convert Interactive form in to static form before sending it to iPhone? Hi I testing out your pdftoolbox cmd line product and I'm trying to remove the XFA from a dynamic xfa PDF but it does't seem to work. After using the removexfa option I'm still unable to open the PDF in the browser of Adobe. Any suggestion?